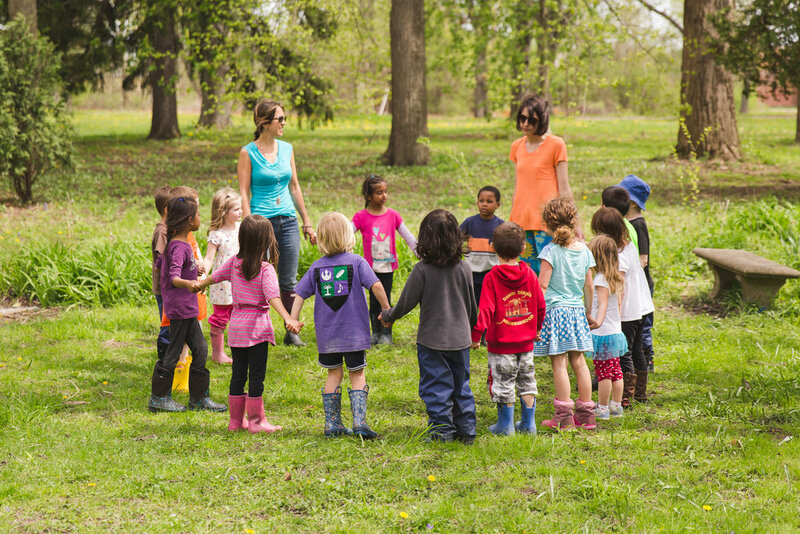 The primary class for 4-6-year-olds is a mixed age nature kindergarten class. Students spend up to half of their day exploring the woods, water and open fields on our 42-acre campus. The other half is spent in the classroom. Inside students have plenty of time for creative play combined with group time, yoga, Spanish, music, and art depending on the day. Each morning starts in Chipmunk Valley, our school playground. Parents say goodbye and students play while waiting for classmates to arrive. The ringing of jingle bells tells the children it is time to begin our day! Most mornings we head to the flagpole to greet the flag. The flag often gives us clues about the weather by what type of dance it is doing. If we are lucky, the flag will wave hello to us after we sing one of our flag songs. From the flagpole we head to one of our many favorite areas to explore. Some days bring us to the “galloping meadow” by the pond, while others take us to the “ Three Little Pigs Piles “ where we can explore piles of dried plants, gather sticks and twigs and pile up rocks. Others take us to the school garden. Rain and snow have only added to our adventures…puddles have been fully embraced, icy puddles have become skating rinks and of course, there is always mud. Glorious mud. After the Kings and Queens have ruled their kingdoms, the cheetahs, horses and puppies have had a romp in the forest and the pirates, ninjas, mermaids, cowgirls and cowboys have conquered or saved whatever needed conquering or saving, we all head inside. We greet the day and each other with a favorite song, “Good morning dear Earth". From here, our Star Helper for the day helps lead us to find today’s date and day of the week. Our calendar time also offers opportunities for counting, patterning, graphing and handwriting. Depending on the day of the week, we either enjoy time immersed in Spanish with a native speaking instructor, stretch and bend our bodies in yoga, or express ourselves through song during music. Art explorations vary from collage and painting to still life drawings and clay creations. The second part of a typical day in the Primary class finds us in the Sunshine Room where we gather to enjoy a snack together. Each child is responsible for setting their place, with a plate or bowl, spoon and cloth napkin. After a blessing is sung, the day’s snack is served family style. During creative free play our hallway quickly transforms into a busy highway as wooden dump trucks, race cars, and train cars make their way from one end to the other. The Fairy Room is a colorful place to play pretend with dress up clothes, silks and crowns at the ready, children deck themselves out before setting the table for tea or whipping up a treat in the play kitchen. The Snowflake Room, is always bustling with busyness! Our writing table rarely has an empty chair as children take turns coloring, cutting, gluing, stringing and creating! The art easel is another popular stop, as is the sensory tub which changes with the season and offers opportunities to scoop, dig, dump, count, sort and search. Before we know it, its time to ring the jingle bells to signal clean up time and just as quickly, we are back in our boots and coats!